Our 3 bed, 3 bath detached villa offers superb comfort and convenience. For families or groups. There is a beautiful view towards Mar Menor and the Med from the front terrace which has a built in BBQ, dining table , sun shade and chairs. All day winter sun on the private roof top terrace, a wonderful sun trap for your holiday! The villa is air-conditioned/heated, has a spacious lounge with a large flat screen satellite TV and DVD. The dining area is modern and comfortable and leads onto the back terrace. The modern kitchen is very well equipped. Downstairs are 3 bedrooms and 3 bathrooms. French doors lead to a further terrace from the main bedroom which has a dressing area leading into the en suite marble bathroom. The 3rd bedroom has a new en suite shower room, all bedrooms have large wardrobes. The villa is clean and well presented and within walking distance of La Manga Club's main activity areas: the Tennis Centre, the Oasis pool and bar, the pitch and putt, crazy golf, shops and restaurants. The Villa: Situated on the Costa Calida in Murcia Spain, La Manga Club is approx 20 minutes from Murcia Airport and Cartagena. Budget airlines such as EasyJet, Ryanair & FlyBe are currently offering low cost flights from around the UK. We are always open to discuss mid and low season deals to take advantage of the lowest air fares. Holidays to La Manga Club can be as active or as relaxing as you choose. The climate is ideal for all kinds of outdoor sports and recreation, from horse riding and mountain biking to bowls, scuba diving and go karting. 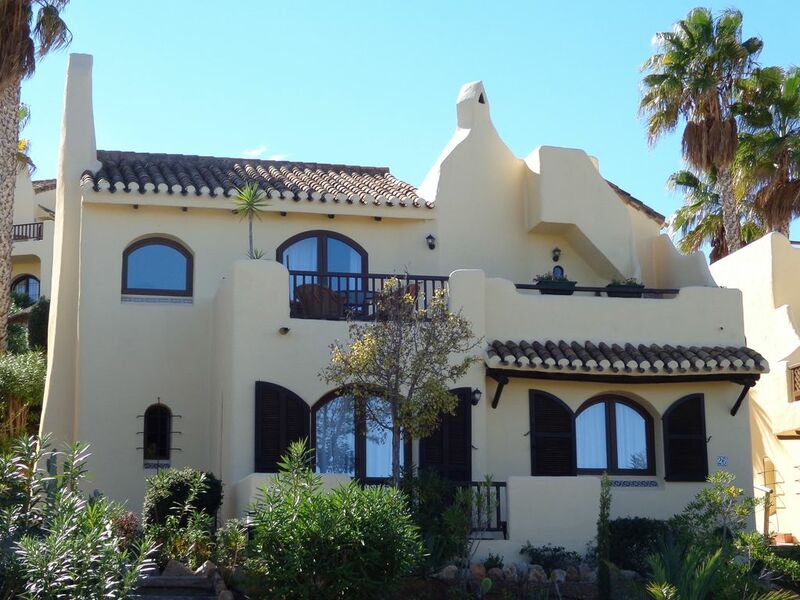 This traditional villa accommodation has a large lounge and separate dining area. There is a modern fitted Italian kitchen, fully equipped with all modern appliances. Outside, the terraces are generous with plenty of room for dining, sunbathing, etc. The built in barbecue is a superb facility on the front terrace. Sporting Facilities: Golf and Tennis. If you love golf and dream of playing on beautiful, top quality courses in an ideal, year-round climate, La Manga Club is the perfect golf destination. If you are a tennis enthusiast, La Manga Club could easily be defined as the ultimate tennis resort in Spain. Fitness and Leisure 7 day membership: The Spa at La Manga Club offers its guests the ultimate wellness experience, combining European spa traditions with international flair. Set out over two floors, this stylish and spacious facility includes saunas, steam rooms, jacuzzis, fun showers and a tranquil relaxation area, as well as a large, superbly-equipped gymnasium, fitness classes, dedicated fitness studio and 8-lane, 25m lap pool with separate children's pool. A total of 13 treatment rooms offers a vast array of pampering, soothing, rejuvenating and relaxing treatments using the finest quality products and the latest techniques. Visitors can buy day, week or longer membership passes.There are many bars, entertainment and lots of facilities for the kids, including the GAMES ZONE, a few minutes walk from the villa, with XBOX, pool tables, etc. For the sightseers, historic cities, bustling market towns, fishing villages and areas of wild natural beauty surround La Manga Clu b. La Manga Club offers a Junior Football Academy. New this year, Saturday evening at Mulligan's is a Casino night. Near La Manga Club, the Mediterranean and Mar Menor Sea are perfect for water sports such as sailing, windsurfing, parasailing, kite surfing, water skiing and more. The nearby marine reserve is one of the best scuba diving sites in Spain. Nature lovers are sure to enjoy the neighbouring Calblanque Natural Park with its beautiful scenery, mountains, beaches, dunes and wide variety of plants, wildlife and birds – a real treat for ornithology enthusiasts. Cycling is one of the healthiest and most exciting ways to discover the resort and its surroundings, from the green golf courses to the stunning cliffs overlooking the Mediterranean. The terrain varies from fairly easy roads with some hills within La Manga Club or the miles of flat, easy routes around the Mar Menor, to challenging off-road routes and some serious gradients in the hills surrounding the resort. Biking La Manga at the Independent Activity Centre in La Manga Club offers a great selection of the latest generation of mountain bikes for all levels of experience, as well as road bikes, which are great for visiting nearby villages or beaches. Bikes can be hired for as little as one day to as long as a week or more. Helmets, locks and maps are all provided. Modern glass table and chairs, an extra chair is provided for 7th person. Table mats High chair available and children plastic mats. A selection of books is provided for your convenience. 3 terraces and large roof terrace equipped with seating and sun beds. Cushions stored in the villa. Large parasol over circular table. Reduced rate golf/tennis . We have residents rates for 6 persons. Approx. half public rate. Please discuss special offers with owners. Spa and pool facilities in Las Lomas village, paid for locally. Lovely pool, very close to the villa, free sun beds. The property was refurbished in 2008 and a further shower/ WC was added in early 2009. Double glazing to the front 2010 and 2011 Free wireless broadband internet. Wood burner in lounge. The indoor pool, sauna, jacuzzi and fitness rooms are part of the club facilities.This facility is paid for separately. New 7 day pass 75Euros, Half price for children over 6 FREE for children under 6. Day membership also available. This is a very safe holiday resort with 24-hour manned security and surveillance. We had a lovely sunny week in La Manga. House was perfect for what we needed, had plenty of space and is in a great location, easily walkable to the centre. Many thanks for your review, I am pleased that the villa was perfect for your needs. I hope you enjoyed the golf competition, and will return another year. Fantastic holiday home with excellent facilities and great location. First time for us at La Manga Club and we weren't disappointed. Spacious holiday home, very clean and well equipped. 10 minute stroll to the supermarket, restaurants, golf, tennis and large pool complex. We preferred to use the pool outside the villa which was quiet even in Summer holiday season. Our teenagers made full use of the comfortable lounge and Sky Sports. Husband was in charge of the BBQ and the large terrace was perfect in the evenings. We hired a car but once at the resort it wasn't needed. We all had a great time and would definitely recommend this villa. Thank you so much for a great review. We are really pleased that you all had a good holiday and that you enjoyed our communal pool, one of two in the pretty gardens of Los Altos. We are lucky that we have a very good management company and they clean and prepare the villa to a high standard for our visitors. We look forward to you returning in the future. Light, sunny and comfortable. Well equipped and good location for tennis centre. We have stayed in La Manga several times but this was the first time in this property. We enjoyed it very much; the property is light, airy and has everything we needed. The views are lovely and the balcony is sunny and a relaxing place to read a book and have a meal. The beds are comfortable (not always the case) and the whole property is well maintained, clean and easy to live in. We would recommend it without hesitation and will book it again when we come back to La Manga. Well looked after, clean and comfortable property. Owners really easy to work with. Great location in centre of resort. Thank you for your review Neil, it was a pleasure taking your booking. We are delighted that you were happy with your choice of villa for your holiday. The location of this property and access to pools, restaurants, shops and sporting facilities makes it an ideal base. Thank you for choosing our villa for your holiday and for your comments regarding the central location,. We find it very convenient with most facilities close by. We had stayed in the villa for a week in August 2015 and loved the villa, the resort and whole area so much we decided to come back for another 10 days over Spring Bank holiday. The villa was exactly the same and exactly as we wanted it to be. The weather was excellent for the time of year. La Manga, club and strip, were not as busy as the summer of the year before but this was fine by us, in that, as golfing and tennis novices we had more opportunities to play without feeling pressurised for court and course space. Restaurants were lovely as ever and we were all very sad to be leaving to come home - even more than on most holidays. I am sure we will return again soonish and just hope that the villa will be available. Thank you very much for a lovely review of our villa and La Manga Club. It is always good to know that families enjoy it enough to return the following year. The exclusive La Manga Club resort is located on the lower slopes of the pine- covered Murcian Hills amongst the Lemon Groves, overlooking the crystal blue waters of the Mar Menor and the the Mediterranean sea. The two main cities of Murcia and Cartagena are both within easy driving distance. These towns are full of historical interest with museums, art galleries, great restaurants, tapas bars and quality shops. Nearby Cabo de Palos with its harbour, has extensive fish restaurants and bars. The closest beach (La Cala) is a 5 minute drive and has a wonderful fish restaurant set into the face of the rocks overlooking the sea. Mar de Cristal, just ten minutes away, has the coveted blue flag award. This is a beautiful and safe place to enjoy the calm waters of the Mar Menor. There are 250km of beaches and coves on the Costa Calida, many offering water sports and other activities. Some of these are designated national or regional parks and have outstanding natural beauty. Golf: With a choice of three superb, 18-hole championship courses, each with its own unique style and terrain, a Par 47 course and first-rate practice facilities, there is something to challenge you, whatever your age and whatever your level.If you want to learn how to play golf or improve your skills, La Manga Club is just the right place as well. The golf academy provides group and private tuition of the highest standards for all levels, from complete beginners to the most experienced players, as well as special junior golf academy courses for children and teens. Ski: There are 28 tennis courts to choose from, including 20 clay courts, four hard courts and four artificial grass courts, as well as two paddle tennis courts and a squash court, not to mention a pro shop, equipment hire services, racket service centre, fitness centre and numerous other services.La Manga Club's superb tennis facilities are complemented by a top-notch Tennis Academy offering the latest digital coaching technology and first-class tuition for all ages, all under the expert guidance of our team of tennis professionals. La Manga Club also offers Junior Football Academy courses during the school holidays, allowing keen young footballers (the stars of the future!) to learn and play on pitches used by their idols. More choice: Fitness @ Spa La Manga Club, Swimming & Sunbathing, Water Sports, Scuba-diving,Lacrosse,Road and Mountain Biking. We accept payment in Pounds sterling or Euros by arrangement. The conversion tool is for your convenience as a guide only. Actual rates in other currencies must be checked and agreed with the owner.